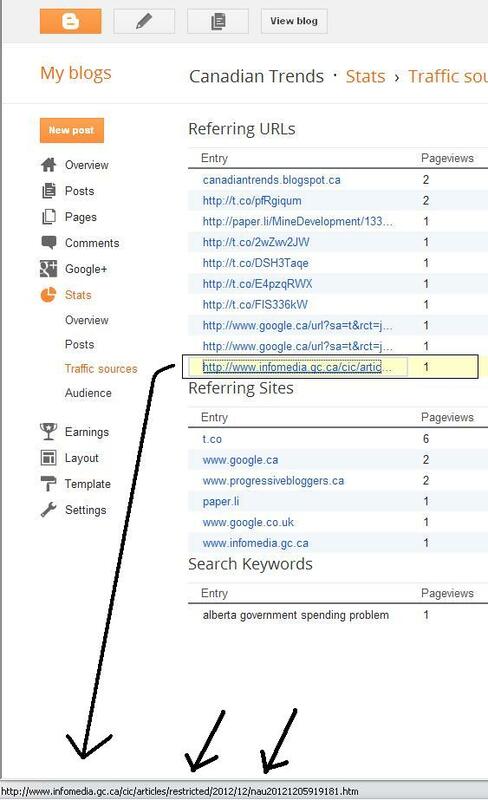 Canadian Trends: Update-1: What is infomedia.gc.ca? Non-partisan trends and commentary for critical thinkers. Browsing my stats, I've received a connection of interest. Notice the name of the document that sent the request! The requesting website is "infomedia.gc.ca", it won't connect for me. It probably requires a network address from within the government. This entire website is restricted from the public, but the requesting article itself appears to be from within a restricted zone of the restricted website. The article itself? "NAU"? North American Union? With a timestamp of the 5th of December. The only other reference I could find is a tweet from 2010. This one, while unrestricted, still won't resolve for me. So what is this infomedia.gc.ca? and why is an article seemingly about the North American Union (maybe it's just coincidence) referencing my blog? Hmm. 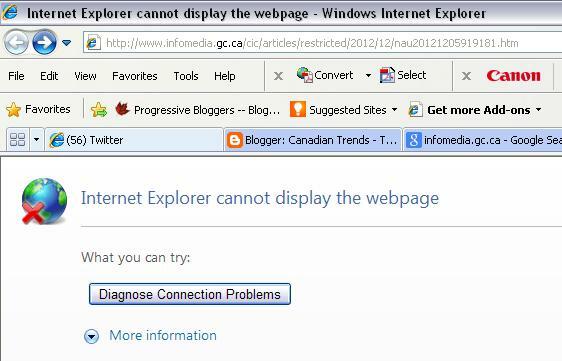 Another reference to infomedia.gc.ca has been sent to me. Click here to recommend this post on progressivebloggers.ca and help other people find this information. Richard Fantin is a self-taught software developer who has mostly throughout his career focused on financial applications and high frequency trading. He currently works for eQube gaming systems. Nazayh Zanidean is a Project Coordinator for a mid-sized construction contractor in Calgary, Alberta. He enjoys writing as a hobby on topics that include foreign policy, international human rights, security and systemic media bias. Has Canadian Trends run it's course? Do you think you could get near PM Harper? Should the U.S. attack Syria? Do the Bilderberg meetings concern you? Can you currently afford to purchase a home? Hurricane Sandy highlights the importance of preparedness. Do you actively store water and other emergency supplies? Has QE3 bolstered your market confidence? Would you support a strike of parliament as described in my post 'A Crisis of Accountability'? How should Alberta work to solve it's fiscal issues?